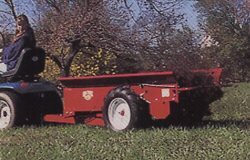 Millcreek Model 27-Deluxe Ground Driven Manure Spreader with poly floor.Comes with feather touch controls, wheeled jack and endgate.Ground drive, 28 cu.ft. capacity spreader. Perfect size for stables with 2-4 horses. The 27 can be pulled with a 10 hp lawn and garden tractor. It comes with "Bear Claw" beaters, positive chain drive and all steel construction with industrial rust proofing. Wheels are 6x12x4, ag-traction. This unit fits easily through a 4' door. OA LxWxH=9'3"x46.5"x26.5" Watch video here For product literature click here You will need adobe acrobat to open the file.